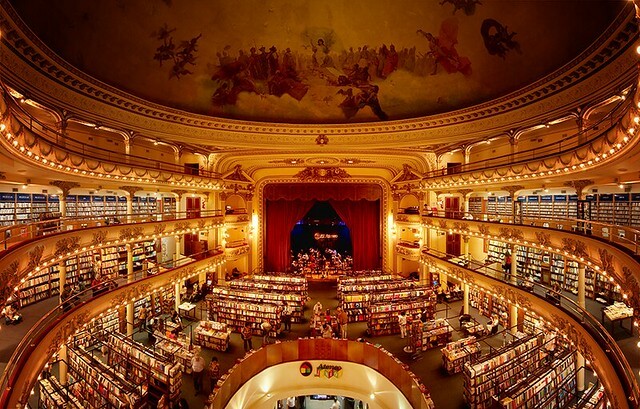 This impresive bookstore is considered to be one of the most beautiful in the world. Set in what was once the Grand Splendid Theatre, and conserving the grandiose architecture whilst adapting its function to a bookstore, it is one of the city’s jewels. This entry was posted in Architecture, Off the Beaten Path, Where to Go, What to Do and tagged architecutre, bookstores, buenos aires,, el ateneo, places to visit, recoleta, Recommedations, south america, theatre, touring, visiting buenos aires, Where to go by Fierro Hotel Staff. Bookmark the permalink.